Sainik School Korukonda Entrance Exam 2019-2020 Admit cards/Hall tickets: Sainik School Korukonda Entrance Exam 2019-2020 application form, Sainik School Korukonda Entrance Exam 2019-2020 Prospectus, Sainik School Korukonda Entrance Exam 2019-2020 Hall tickets/Admit cards, Sainik School Korukonda Entrance Exam 2019-2020 Exam date, Sainik School Korukonda Entrance Exam 2019-2020 Results, Sainik School Korukonda Entrance Exam 2019-2020 Selection list results, Korukonda Sainik School Admissions 2019-2020, Korukonda Sainik School 6th Class admissions, Korukonda Sainik School 9th Class admissions, Sainik School Korukonda Entrance Exam Schedule. Sainik School Society All India Sainik School Entrance Exam/The Sainik School Korukonda Entrance Examination will be held for admission to class VI & IX. Boys who are between the age of 10 to 11 years and 13 to 14 year for Class IX are eligible to take the Entrance Examination. For admission to class IX, the boys should be studying in class VIII in a recognized school. Admission will be made strictly in order of merit only in classes VI and IX. In case the Entrance Examination cannot be conducted in any State/UT on account of administrative problem, a separate order will be issued to conduct another Entrance Examination on a date fixed by the Honorary Secretary. 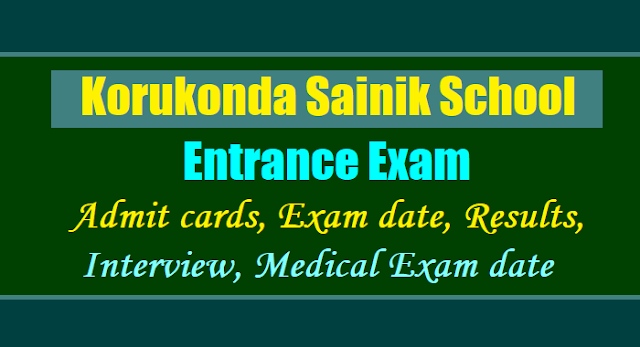 Sainik School Korukonda Entrance Exam 2019-2020 Admit cards/Hall tickets download from 20-12-2019: Admit card for Entrance Examination for both in the website sainikschooladmission.in. in candidate’s Login. The Candidate can view/download their Admit Card and Can take a printout of it by entering their Application Form number. In the Admit card the actual date and venue of the Common Entrance Examination will be mentioned. Age Limit: (a) Class VI – Boys born between 02 July 2006 & 01 July 2007 (both days inclusive) (b) Class IX – Boys born between 02 July 2003 & 01 July 2004 (both days inclusive) and should have passed class VIII from a recognised School before admission. Class IX - 20 (including all Reservations of State / Other States / Union Territory). Prospectus, Application Form and question paper of previous years can be obtained by post from “Principal, Sainik School, Korukonda”, Vizianagaram District, A.P - 535 214, on payment of Rs.475/- (Rupees Four Hundred and Seventy Five only) or Rs.325/- (Rupees Three Hundred and Twenty Five only in case of SC & ST) through DD drawn in favour of “Principal, Sainik School, Korukonda” payable at State Bank of India, Sainik School Korukonda Branch, Code No.2791. Payment through MO and IPO will not be accepted. Requisition for Prospectus should clearly indicate Class for admission, Category (General / Defence / SC / ST) and Medium for Entrance Exam. Previous years‟ question papers will be made available only till stocks last on additional payment of Rs.25/- (Rupees Twenty Five only) per set. School Korukonda Branch, Code No.2791. Downloaded application forms submitted without the requisite DD will not be accepted. Last Date for completed application forms to reach this school is 30 November 2019. There are two ways of filling up the application form. For Offline application form candidate may visit to nearest Sainik School. For online application form the eligible candidate can apply online in the website sainikschooladmission.in. Candidates can apply Online Application Form as per his eligibility. Candidates applying for (VI,IX) It is suggested to candidates to carry recent testimonials, scanned photograph and signature with him while applying on-line, so that right information may be entered. The candidates are advised to fill information carefully. It is mandatory for candidates to upload their recent colored passport size photograph and signature on the panel to complete the registration process successfully. Printing of Application form is not possible without uploading the photograph and signature. The photograph and signature must be less than 1MB in size. After successful registration the candidates have to choose the payment option. . Candidate can submit the admission fee online through the Credit Card, Debit Card and Net Banking by using Online option. NOTE : Once the Payment is done successfully candidate can edit his Application form within 72 hours. The candidate can view / download their Admit Card by entering their Application Form number and Password (sent through SMS at the time of Registration). In the Admit card the actual date, time and venue of the Entrance Examination shall be mentioned. The candidate signs the Application Form at the specified place. The candidate must keep a photocopy of the Application Form for use as reference for future correspondence. Admit card for Entrance Examination for both in the website sainikschooladmission.in. in candidate’s Login. The Candidate can view/download their Admit Card and Can take a printout of it by entering their Application Form number.In the Admit card the actual date and venue of the Common Entrance Examination will be mentioned. STEP-7: RESULT: The result will be displayed at sainikschooladmission.in. If any candidate feels any difficulty in applying the Online Application Form, Payment status etc. may take the help of the Helpdesk. Candidates are advised to keep their application number and password secret (Sent at the time of Registration). Do not disclose this information with any others, so that nobody can change your profile. Only those candidates shall be allowed to appear in the Entrance Examination whose application fee has been cleared. Candidates should bring with them BLUE / BLACK Ball Point Pens only. Books, Written Notes, Calculator, Mobile Phones and other electronic devices etc. will not be permitted to be carried in the examination hall. In case of any discrepancy found in Application, Testimonial at any stage, the candidature of the candidate will be cancelled without giving any intimation. Please allow popups in your browser before filling the form.